Be the first to review this 2019 Cadillac XTS. The 2019 Cadillac XTS is a large sedan whose modern interpretation doesn’t erase its throwback feel. Known for its fabulous ride, it has the vibe of a GM version of the Lincoln Town Car, and is popular with limousine services. It can be stretched, and often is. We don’t know if this is outside the XTS box, or part of it, but it’s even available with armor plating. Or as a hearse. The base engine is a strong and smooth 3.6-liter V-6 making 304 horsepower and 264 pound-feet of torque, using a 6-speed automatic transmission. But there is also an XTS V-Sport model to erase the notion of an old-man cruiser; it uses a twin-turbo 3.6-liter V-6 making 410 horsepower and 369 pound-feet of torque, also mated to a 6-speed automatic. All-wheel drive is standard in the V-Sport, which might almost be considered a sport sedan. 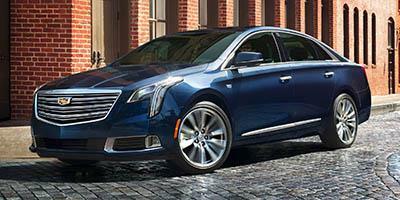 In the other XTS models, front-wheel drive is standard, with all-wheel drive available. Comprehensive crash-avoidance technology is available, but not much is standard. Still, the National Highway Traffic Safety Administration gives the XTS five stars overall. The Insurance Institute for Highway Safety gives the top Good ratings in each category, though the tricky small-overlap test has not yet been performed. For a car this big, the fuel economy is excellent, EPA-rated at 18/28 mpg City/Highway, or 22 mpg Combined with front-wheel drive, and 17/26/20 mpg with all-wheel drive. And that’s on regular fuel. The V-Sport with its extra horsepower brings the mileage down to 16/23 mpg City/Highway, or 18 mpg Combined. The Cadillac XTS was freshened in 2018 with a new grille and LED headlamps, new fenders, and new front and rear fascia, including bumpers. There were also suspension changes to improve the ride, and increased sound insulation to make the cabin even more quiet. There were upgrades to quicken the response of Cadillac’s CUE infotainment system, along with updated graphics, personalized profiles, and smartphone-like navigation. With all of these improvements, the 2019 model, now in the fifth year of its generation, gets no more changes.